Ware chairs were made between 1800 and 1940 by five generations of a family in the Cumberland County community of Roadstown, northwest of Bridgeton. The patriarch, Maskell Ware, found a niche in the furniture market by turning out rocking chairs. Subsequent Ware chairs were characterized by slat backs, woven-rush seats and uprights, and stretchers turned on a lathe. In Village of Roadstown – Greenwich Rd. business of making rush seated-ladder back chairs. Before this he was an apprentice to John Laning, Chairmaker. Small house (salt box style). I own a Ware chair that I purchased back in 1987 from a decendent of the Ware family. Carved into the back of the chair is the inscription “MADE.BY.HENRY.C.WARE 1833”. Are there any decendents of Henry C Ware out there? I am a daughter of David William Ware. Grandaughter of Robert L Ware. My great grandfather was related to this family. 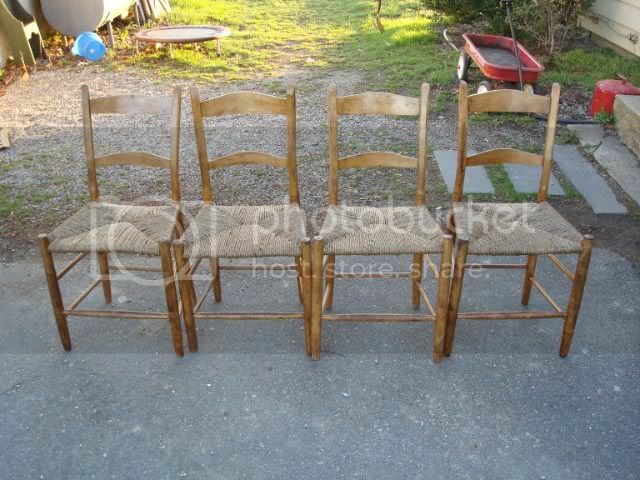 I inherited a Ware chair just like the chairs in the above picture. I always heard my grandmother refer to the chair as the Ware chair and I know she thought of it as a very special chair. I always wondered about the chair and the origin. I was happy to find this site and to know something about them. Does anyone know the value of these chairs? Ours is in really good condition. Is there a way to tell the approximate date it was made? I am the great grand daughter of Haskel and Vesta Ware. They lived on Quinton- Salem road in Salem NJ. I have always been told that our family made chairs. There daughter Alice was my grandmother and she also had a sister Virginia. Aunt Virginia had a couple of the Ware rockers in her attic. Her daughter has probably inherited them. Hi, I was raised in Greenwich NJ. I inherited a ware chir exaxtly like the one in the picture. Hi JoAnn – Just wanted to say hello – I’m related to this family – lots of family info – hello! Hi! My name is JoAnn Ware Abbott, and I think I might be related to this branch of the family. I am 53, born in 1959 to Philip and Carolyn Ware. My father was born in 1931m and my paternal grandfather was James Milton Ware. I remember dad telling me about ancestors who became famous for making caned chairs. I will try to get more geneological info for you if you are interested. My FB page is JoAnn Abbott, in case you would like to look me up!